Made of sisal rope & vegetable leather. Hung from small leather strip with quick link (no S tie). Use this Fuzzy toy as a foot toy for your medium or larger sized parrots (remove the quick link). 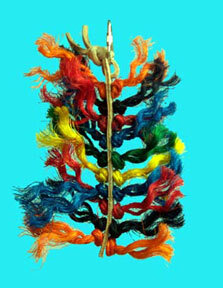 This is a great choice for feather pickers with all that colorful sisal to preen and chew!